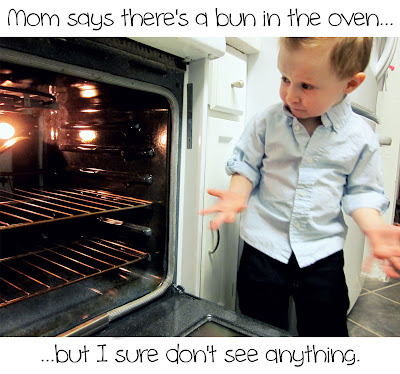 If I know one thing about toddlers, it's that messes keep kids busy. The messier something is, the longer it entertains... And the more laundry it creates. Somehow, a little extra laundry always seemed like a fair compromise for a few minutes of peace. Until it didn't. 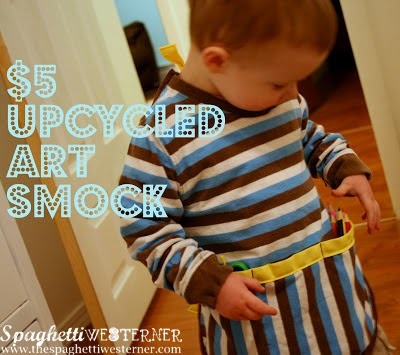 I was sick and tired of doing laundry, so I decided my little man needed a smock to keep from having to change entire outfits every time we got out the markers or paint. But everything I could find was expensive or not quite right, so I decided I could do better. I give you: The Upcycled Art Smock. Let me start by saying that I possess only very basic sewing skills. Seriously, if you can press the pedal on a sewing machine, you can make this. You will need a t-shirt a few sizes bigger than your child wears now. I got mine for a buck at the thrift store, but this would be a great way to reuse older kids' clothes, too. You'll also need some bias tape (sometimes called quilt binding), which you can find at any craft store. (For the record, I think bias tape is a miracle). Besides that, all you need is thread, elastic, and scissors. Start by cutting off the back of the shirt. Basically just leave a few inches on each side. I rounded off the shirt near the bottom as I cut. Using the piece of fabric you just cut from the back of the shirt, cut a pocket to put on the front of the smock. I rounded mine off to match the round part I'd made on the shirt. Sew a strip of bias tape along the top of your pocket flap. I recently discovered bias tape, and, as I mentioned before, I think it's a miracle. It takes my seriously amateur projects that never have straight seams to a level worthy of some serious self high-fives. Instantly. It means I can be a sloppy cutter and sew-er and still end up with something I'm not ashamed to show my friends. Or my very crafty and talented mother. I use "double fold" bias tape, which basically acts like a sandwich over the raw ends of the fabric. Or...more like a pita pocket since one end is sealed. There's also something called "single fold" bias tape, but I have yet to figure out a use for it that would make me call it a miracle. Or a use for it at all. Though, I'm sure someone who actually knows how to sew could tell you what it's for. Anyway, back to the smock. Sew your pocket to the front. Make sure not to sew across the top...or you won't have a pocket anymore. I sewed the pocket on just as you see it in the picture - don't worry about the raw edges. Once the pocket was attached, I sewed two straight lines from the bottom of the pocket to the top to create three "compartments" in the pocket. Remember how I told you not to worry about the raw edges? That's because the bias tape is coming to the rescue yet again! Sew it all the way around the raw edges of the smock. Doesn't that look snazzy? I used a few strips of bias tape to make the ties. I just sewed the open edges shut. Then I folded the strips over just a little bit on one end and sewed one onto the back edge of each side of the smock. Two short straps at the top near the neck, and two longer straps in the middle of the shirt, a few inches above the pocket. You could really probably stop here and have a perfectly functional art smock. But since my goal was mess containment, I decided to tighten up the arm holes a little so they wouldn't gap (since the shirt is a couple sizes bigger than my toddler). To do that, I cut a slit on the inside of the wrist cuff. I measured a piece of elastic around his wrist, added a little bit on the ends for a seam allowance, and slipped it into the slit in the cuff. I attached a safety pin to the end of my elastic to make it easier to fish through. Once the elastic came all the way around and back out through the slit, I simply sewed the two ends together. And that was it. I didn't even bother to sew the slit back up since it's inside the shirt. But if you want to be all ambitious and get rid of the slit, I won't stop you. There you have it. My smock cost me a whopping $1, which was the cost of the thrift store shirt. Everything else I had on hand. Even if you had to buy bias tape, though, I bet the project would still be under five bucks. And it only took me about 30 minutes. In fact, it was so quick and easy, I made a second one. Here's the smock (and the whirlwind toddler) in action. "Look, Ma, I can cram all of my chalk into this one little pocket." "My hands may be filthy, but my shirt sure isn't thanks to this amazing art smock my super talented and awesome mom made for me." I'm totally sure that's what he was thinking. What are you waiting for? Go forth and be super talented and awesome. I've you've ever had a child or been around kids, you already know that kids are hilarious. I mean, there was a whole TV series hosted by Bill Cosby about kids sayin' the darndest things. 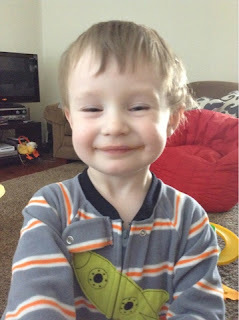 But, until living with a three-year-old 24-7, I never realized that the hilarity is so frequent. Kids not only say the darndest things, they say them all the time. So, today I'm going to share with you a few of my favorite Little Spaghetti moments from the past couple weeks. Short story-style because most of them need no further commentary. We were in the car and that song by Far East Movement came on, "Like a G6." Little Spaghetti started singing along, mostly just indiscernible sounds and not real words. Until the chorus, when he started singing loudly and clearly, "Like a cheese stick, like a cheese stick!" He woke up from his nap a few weeks screaming. I ran into his room and asked him what was wrong. "Mommy! Help! I ate a Fraggle!" he said. We were leaving the store and driving out of the parking lot. There were some pigeons on the road in front of us. Little Spaghetti said, "Mom, are you going to run over those birds?" "No," I responded, "it would kill them if I ran over them." "Why?" he asked...because he's three. "Our car is big and heavy, and those birds are small. There's no way they could take on a car like this," I explained. "Well..." he said, "they're just going to have to eat lots of foods to grow bigger and stronger. They need to eat more clouds!" Little Spaghetti was drawing outside with chalk, but after a few minutes he came back in, saying it was too cold out. "Wait here," I said, "I've got something that might help." I went downstairs, knowing that we had an easel that's a chalkboard on one side. It was still packed - like half of the stuff we own - and buried in the storage room in the basement. He saw me coming up the stairs with the chalkboard, and shouted, "Mom! You're a genius!" Hey, I'll take it. One of Little Spaghetti's favorite movies is Despicable Me. Consequently, when he wants something, he now says, "Minion! Get me some water!" And sick. Oh, so sick. Which (hopefully) excuses my prolonged absence. I was sick during my first pregnancy, but I'd forgotten what it was like. I've started picking what I eat based solely on what it will taste like coming up instead of going down. For the record, smoothies almost always win in the "Most Pleasant to Puke Up" category. Kiwis and sunflower seeds lose. It's not even just being sick that gets to me, though. It's how much smells and tastes change. Things I used to enjoy repulse me. I can't even sit at the table with my husband when he eats hot salsa from a certain burrito place in town without gagging. And never m ind kissing him for the next eight hours unless he goes to the dentist for a professional cleaning in the meantime. After Little Spaghetti was born and I'd had some time to hold and nurse him, they whisked him away to get bathed and checked out. My husband, naturally, went with him. A nurse helped me get cleaned up and then brought me to our postpartum room. And then, it was just me. It was the strangest quiet, peaceful quiet. I was all alone. No baby in my belly. No labor chaos. No family and friends. I looked over and saw a wrapped Jimmy John's sandwich laying on the bedside table. I didn't think about how it had gotten there. To this day, I don't know who the angel was that brought me that sandwich. But I assumed it was safe, and that it was for me, so I dug right in. Let me tell you, that sandwich was probably the most delicious thing I've ever tasted in my life. I'm not exaggerating. It wasn't even a type of sandwich I liked, and it had toppings on it that I would never order. Maybe it was the fact that I was ravenous after one of the most physically exhausting things I'd ever done - giving birth. Maybe it was the fact that I'd only had broth and jello for 24 hours straight. Maybe it was the fact that the hormones were finally draining from my body. All I know is that it. Was. Heaven. Nothing has tasted that good since. So, I'm counting down until the birth of this babe. You know, 'cuz I'm excited to have a baby and all. But also, because I can't wait until food tastes good again. There's a sandwich with my name on it waiting for me in October. You can count on it.